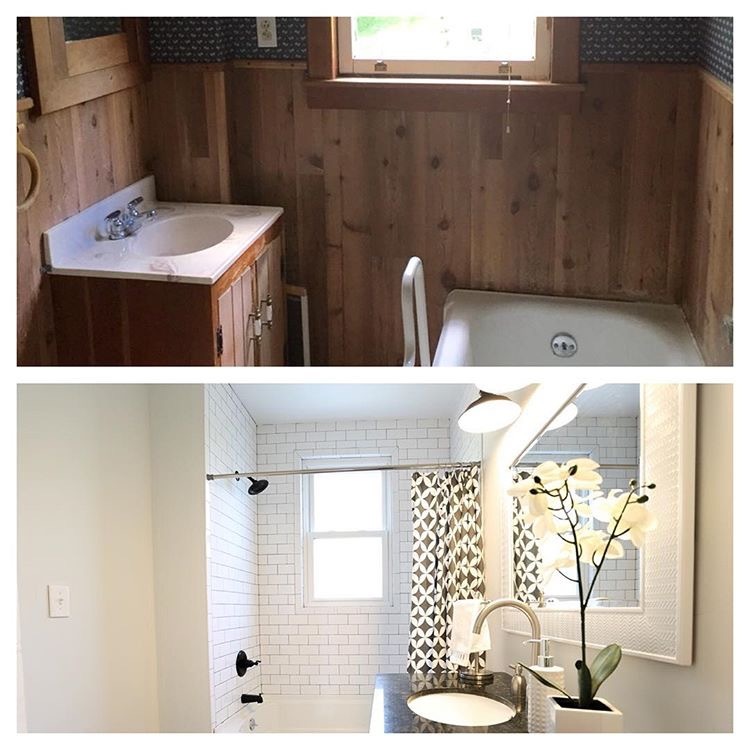 I post a lot of before, during and after photos of our projects on Instagram, but if you don't follow us there, you could have missed the amazing transformations of our renovated homes. 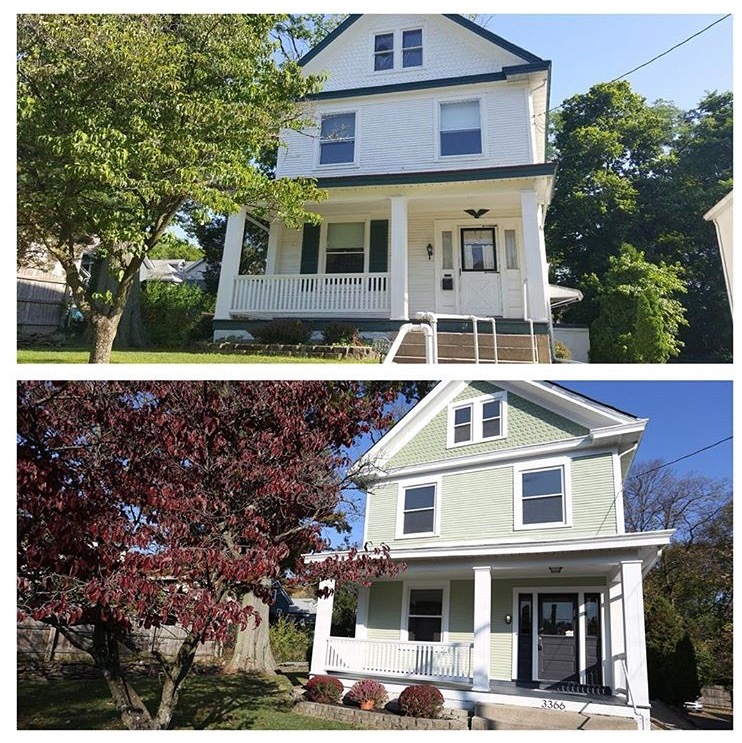 Here's a collection of before and afters of our "modern farmhouse" renovation completed in the fall of 2016. Hover over the slideshow to see sources for paint colors and finishes. Enjoy! Main siding color is Sherwin Williams "Softened Green" (SW3246). Third story color is slightly darker: Sherwin Williams "Green Onyx" (SW9128). Accent wall color is Benjamin Moore "Cheating Heart". Accent wall color is Benjamin Moore "Cheating Heart". Walls are Sherwin Williams "Nebulous White". Refreshed the fireplace by painting it white. Pendant light is from Target. GE Artistry appliances are retro-modern cool. Range hood is from Signature Hardware. Delta Trinsic faucet. Backsplash is by Merola (special order online from Home Depot). Appliances are GE Artistry series, now discontinued. Pendant light is West Elm. Cabinet knobs and pulls are from Schoolhouse Electric. 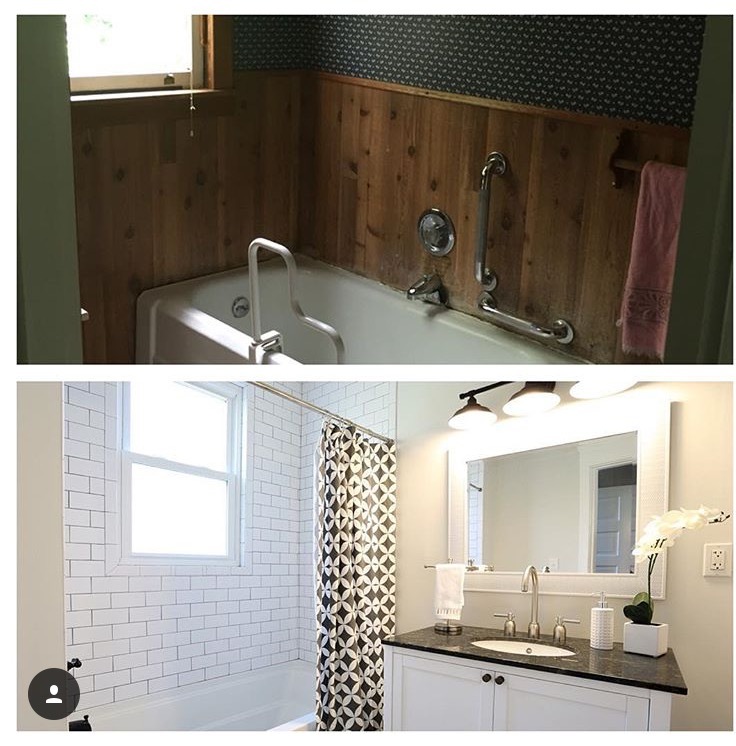 We transformed the former pantry into a half bath. Kitchen/bath floor tile is from Floor & Decor. Counter tops are marble. Shelves are from Etsy seller "DeliriousByDesign". Wall color is Benjamin Moore "Cheating Heart". Wall color is Sherwin Williams "Nebulous White". Rug is from Target. 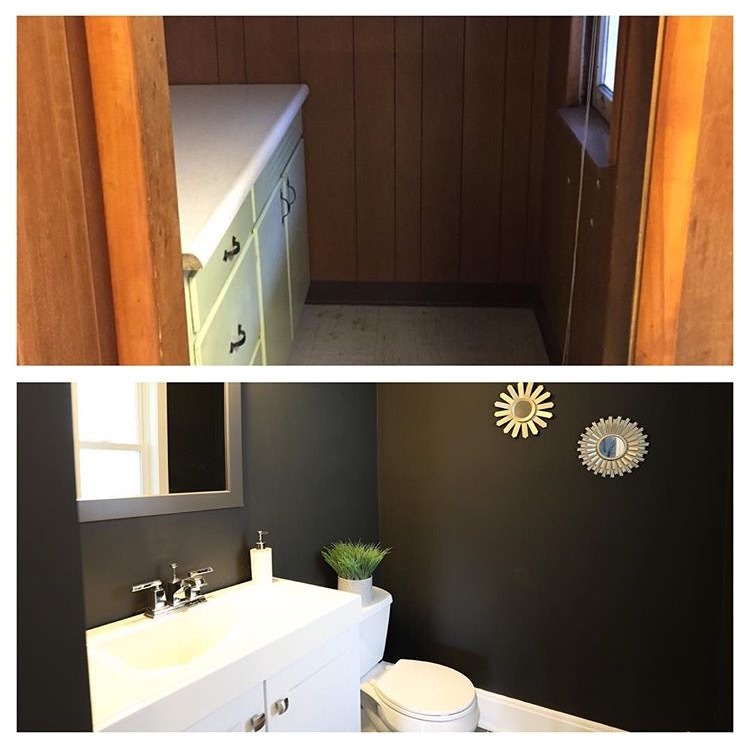 Water closet color is Benjamin Moore "Cheating Heart". Grey hexagon floor tiles from Floor & Decor. Vanity, sink, faucet and granite top from Signature Hardware. Light is from Home Depot. Mirror is from HomeGoods. 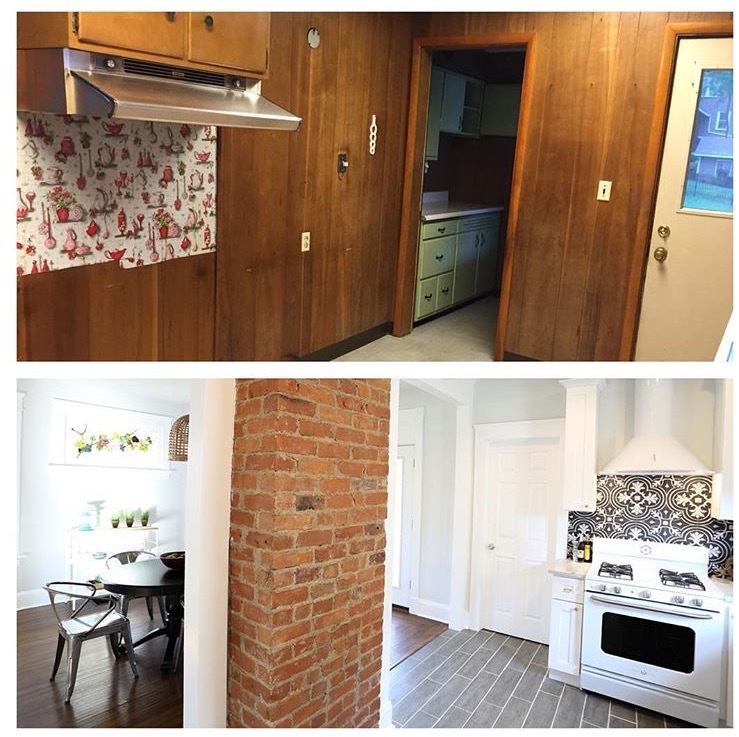 Subway tile from Floor & Decor. 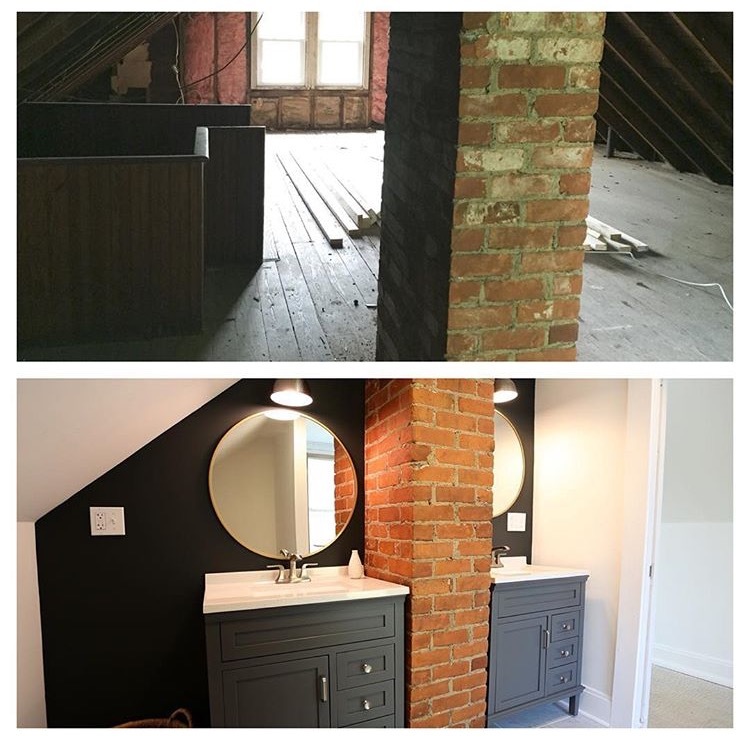 A former third floor attic was transformed into a spacious master suite. Accent wall color is Benjamin Moore "Cheating Heart". Mirrors are Target. Lights from AllModern.com. Vanities are Home Depot. All interior walls are Sherwin Williams "Nebulous White" unless otherwise noted. Trim is off-the-shelf base white.